Recently IHG announced a devaluation of the program with some hotels moving up in the required points for a redemption and a few moving down. In most cases when a brand devalues their points it is not good news, especially since they increased the required points for many properties which now means you need more points to stay for free. For example the Holiday Inn in the Maldives which was a great deal at 35,000 per night. I was eyeing up this hotel for quite some time however I didn’t know my travel dates exactly so I didn’t book it. I guess if I decide to visit I will have to pay the 5,000 extra points since now the property costs 40,000 per night in a redemption. Many London hotels have also increased, I personally don’t stay in IHG properties in London since I find that HappyMonday and Hilton offer better value especially since as a Hilton Diamond I get free breakfast and lounge access. But nonetheless it is not good news. There were 6 properties in Saudi Arabia, three of which went up in points and three that went down, this included the very nice and new Crown Plaza Medinah. The full list of movement can be found here on the IHG site. The Crown Plaza Medina is a new property and it always seems to have good rates and availability. The property now is only 25,000 points instead of 30,000 points. This is in line with the existing Intercontinental Dar Al Hijra which costs 25,000 per night. 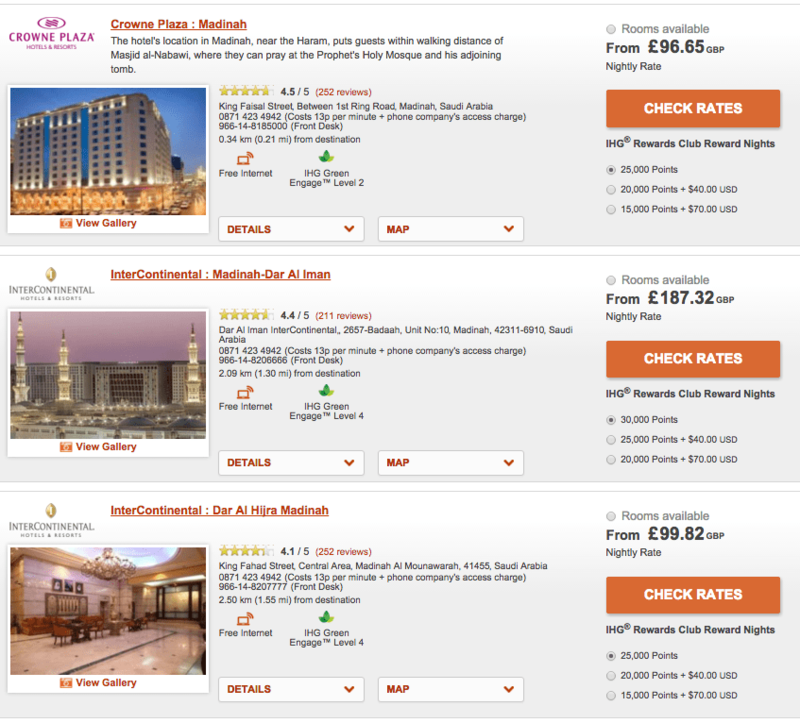 Excellent value if you are planning an Umrah and you are doing the new IHG Accelerate promotion. You can find more here. With the 50,000 points only after two stays you can have two free nights in either the Crown Plaza or the Intercontinental. If you want to save some cash you can pay few nights in cash and then use your points for two free nights. Also remember that if you travel with a spouse you can both redeem your points so you will be getting 4 free nights. During my Umrah last year I stayed in the Intercontinental Dar Al Iman which is just next to the Prophets mosque ( literally), it is still a decent redemption at 30,000 per night but all properties are within a good distance. So it might not be good news all around however for those visiting Medinah, including myself I have to admit I am happy with the reduction in points. I also did a free night redemption using the same Accelerate promotion last year and stayed in the Dar Al Tawhid in Makkah. You can read the review here. I love to Go umrah, i cant Make my 16 yrs son agree, anyone going In group sister if u know Im free to Go now with Good offer. Can i go with my mother to umrah my brother is travelling can meet up in airport. Asailamualaikum. Please advice how do i get automatic hilton status ? You cannot receive automatic hilton status, you have to either stay the nights or do a fast track option of 4 stays.